What are the symptoms of trigger thumb? Is a recovery from trigger thumb with operation possible? 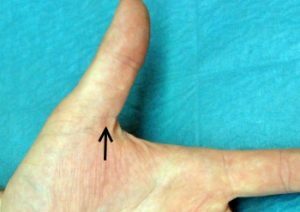 Is a particular risk in the operation of a trigger thumb? Many patients feel soreness at the base of the thumb. The most common symptom is a (more or less) painful clicking or snapping when the affected thumb is extended from a flexed position. The symptoms are usually more pronounce in the morning an during late night. Trigger thumb is often caused by repetitive and forceful use of the thumb. A high risk to get a trigger thumb is by doing unfamiliar work with a hand-held tool. (or sport like tennis or golf). But there is also a hereditary cause of trigger finger and trigger thumb. In some Patient it seems that there is an unknown rheumatic disease with coexistence of trigger finger, de Quervain’s disease, carpal tunnel syndrome and epikondylitis. Be patient! The time it takes to recover from a trigger thumb varies considerably. 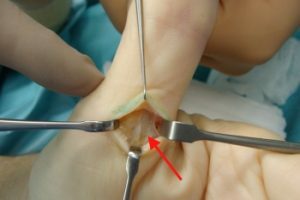 It depends on the severity of the narrowing of the tendon sheath. It is made a small incision at the base of the thumb. The figure shows the skin incision. 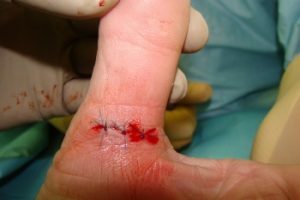 A small scalpel is used to divide the first annular ligament of the thumb. The red arrow in the figure pointed to the divided pulley. In principal: There are the same complications possible during a release of trigger finger (open division of A1-pulley) and the same operation on the thumb. In both operations digital nerve injury is a rare, but a serious complication. It happens more likely during an operation on the thumb. Scar tenderness at the base of the thumb is during manual work more disturbing then it is in a finger.